A PRRA is an assessment to ensure that people being removed from Canada do not face risk of persecution, torture, risk to life/cruel or unusual treatment. An immigration officer decides whether or not you are not eligible to apply for a PRRA. If you have applied for refugee status or have previously submitted a PRRA application that was rejected, abandoned or withdrawn, you may not apply for a PRRA unless at least 12 months have passed. 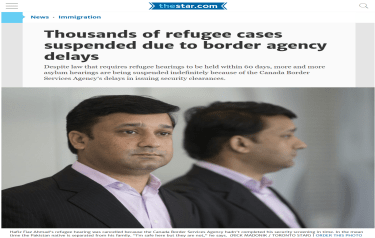 As of December 15 2012, the Immigration and Refugee Board has established a Refugee Appeal Division to consider appeals of decisions made by the Refugee Protection Division (RPD) to allow or deny claims for refugee protection. The RAD may decide to hold a oral hearing if it believes there is a serious issue of credibility with respect to the subject of the appeal and that this issue is central to the decision about refugee protection. In order to qualify for refugee status in Canada, you must be outside your home country or the country in which you usually live, and unable to return because of a well-founded fear of persecution based on your race, religion, political opinion, nationality or membership in a particular social group, such as women facing domestic abuse or people of a certain sexual orientation.